Hello, my keto diet and low-carb food bloggers! The weather's heating up, and so is the backyard barbecue. Your blog readers and email subscribers are hungry for some fresh recipe ideas with a summer grilling theme. I just finished packaging up for you a total of 19 incredible, low-carb summer recipes - grilled meat or fish main courses, with sides to compliment each. There are enough recipes here for 7 complete meals - all using fresh, nutritious ingredients. They're arranged as healthy, balanced "meals." There are 7 meal ideas here altogether - a week's worth of meals, with 2 or 3 recipes per meal. Your readers can feel free to make, eat and enjoy the suggested main courses and sides for lunch or dinner... OR, they can mix and match. This would make an awesome, week-long online series delivered by email! These recipes contain very low amounts of carbohydrates. The most carbs in any one recipe might be tomatoes and onions. These recipes would pass muster with the Low Carb or Keto Audience. Please remind your readers that when it comes to exact carb counts, portions and other factors make a difference. We have a carb counts reference available for free when you click BUY NOW at the bottom. These recipes contain NO processed sugar, NO bread, cereal, pasta or processed grains of any kind. These recipes also do not contain any commonly eaten, high-carb fruits and vegetables. There is NO corn, squash, carrots, potatoes, bananas, oranges, apples or other common fruits. Also NO beans or legumes. These meals contain NO sugary condiments, or table sugar of any kind. These meals do not contain processed foods (with the exception of low-carb, "miracle noodles" in one). The ONLY fuits used in any of these 19 recipes are berries that get the nod of approval from keto diet experts because they're extremely low in sugar. The food combinations used in the meals provided have been designed to facilitate digestion and good health. Meats and healthy fats, low-carb green vegetables, healthy oils and acidic additions such as vinegar and lemon or lime, are artfully combined for flavor and for their high nutritional value. Officially trending with Silicon Valley's Elite as of spring 2017... and it's not going away anytime soon! Named one of the hottest health and wellness trends to watch for in 2017. A quick Google search brings up medical texts detailing ketogenic diet clinical trials and it's positive impact on metabolic and cardiovascular health. Touted as a dieting alternative for diabetics and people who struggle with obesity. Stage and photograph these recipes while kitchen/grill testing them in your own backyard. Use the pictures you take to release a new series of blog posts, or create a summer cook book for low-carb readers to enjoy. Set up a private membership area on your site where people can either join for free or pay a low monthly subscription to receive information, recipes, encouragement, advice and support around the topic of low-carb dieting. Make a professional-quality ebook (online cook book) and sell at an affordable price to thousands of eager buyers that you've collected and added to your publishing list. Use portions of the content to make blog posts that entice people to sign up and learn more. Include your Amazon affiliate links to products that they can purchase after reading your blog post. Also include pay per click ads. To get more traffic and eyes on your blog posts, pay for Facebook advertising exposure that directly targets keto and low-carb readers. Paste segments of this and other keto content and recipes into social media posts that share your blog link and sign-up form for people to give up their email address and hear from you on a regular basis. Turn the tips into videos that are hooked up to your PPC ad account. Each time a video is viewed, there's the possibility of getting paid via a click. (But please don't have the content read by one of those creepy computer voices... I can't stand those!) Hook your videos up for high-volume traffic on social media. File delivery is a single, MS Word document, zipped and delivered via email. Once your order is processed, you will receive an email asking you to confirm your membership, and another email that contains the file/content you just paid for. Your file will also be available from the member area of our Wordfeeder website. So don't forget to put your login info in a safe place! Here's a screen shot of the content in production. The word count is 3,743 total. Delivery is an MS Word file. Be one of the first to grab this excellent deal on the highest quality PLR content! Instant delivery of an MS Word document via email. Don't miss this introductory price offer! Ends soon!! Get this content up before SUMMER and you'll be ready for a flood of low-carb loving readers who can't get enough info on this incredibly popular diet and way of life. FREE PLR Articles when you sign up! PS: Don't forget! 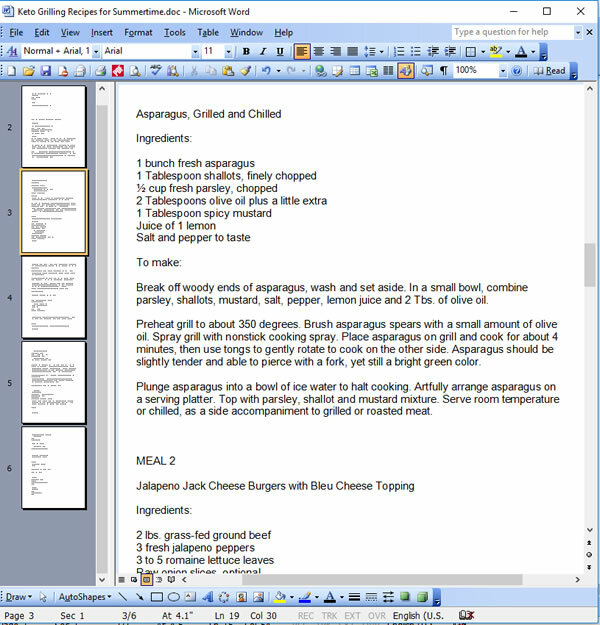 In addition to these high quality written recipes, you also get a TON of free content once you log into the Wordfeeder member area. Check the top menu and look under FREE PLR to see what's offered.